Despite the constant rain, the bride and groom riding in this antique car went through with our plans to photograph their portraits at Point Defiance Park in Tacoma while transitioning from their ceremony church to their wedding reception venue, the nearby Tacoma Yacht Club. I shot this photo of their car driving along a rain-soaked Five Mile Drive through the wet windshield of our own car, blurring parts of the scene in a unique way. 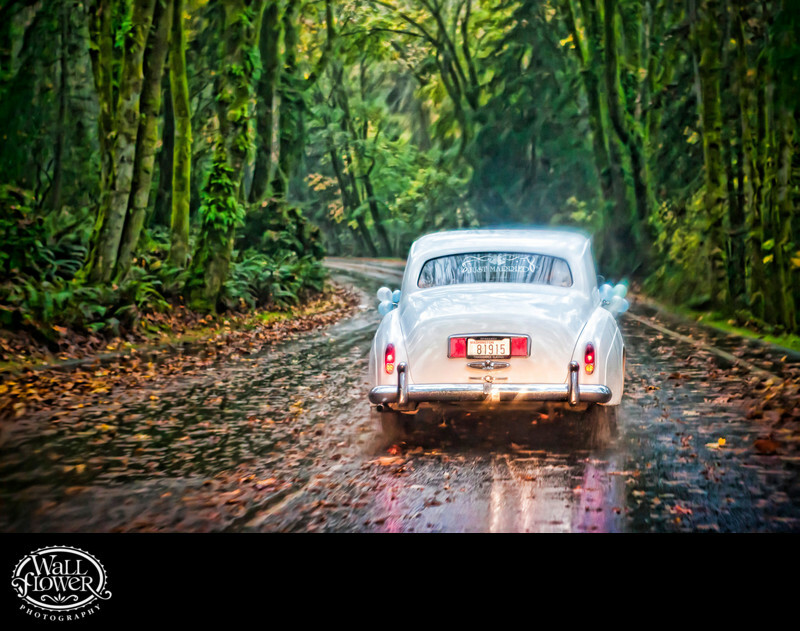 The dead leaves on the road and vibrant green of the mossy forest provide a beautiful setting for the scene, and this photo won an award in a wedding photography competition held by the Artistic Guild of the Wedding Photojournalist Association (AG|WPJA).